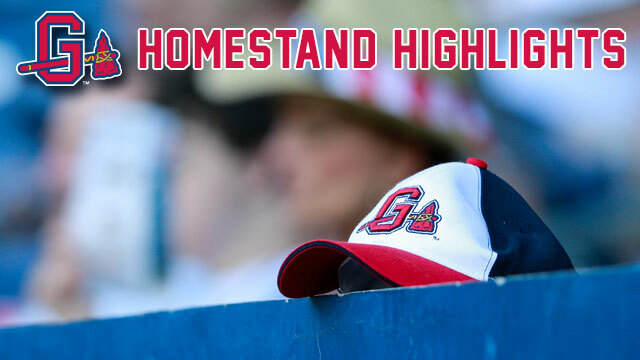 LAWRENCEVILLE, GA - The Gwinnett Braves return home for a four-game homestand from Thursday, July 14 through Sunday, July 17. The G-Braves will host the Scranton/Wilkes-Barre RailRiders (Triple-A affiliate of the New York Yankees) for the first time this season. The homestand is highlighted on Friday, July 15 with a Ron Gant poster giveaway and a fireworks spectacular, both presented by FOX 5 Atlanta. On Saturday, July 16, fans will receive a Hank Aaron bobblehead giveaway presented by Coolray Heating and Cooling and following the game on Saturday night will be the Georgia 811 Diamond Dig. The homestand finale is on Sunday, July 17, and is Military Appreciation Day presented by the Georgia National Guard. Also on Sunday it's Christmas in July, as Coolray Field will be decorated in Christmas spirit and following the game, BlueRidge Helicopters will present a Candy Drop for kids 12-and-under. Scranton/Wilkes-Barre RailRiders (New York Yankees) vs. Gwinnett Braves, 7:05 p.m. Triple Play Thursday - Fans can purchase four (4) infield box tickets, four (4) hot dogs and four (4) sodas for $40, either online or at the Coolray Field Ticket Office, courtesy of Coolray Heating and Cooling. Ron Gant Poster Giveaway - The first 2,500 fans will receive a poster of Ron Gant, presented by FOX 5 Atlanta. The former Atlanta Braves' outfielder will be on the concourse to sign autographs during the game. Hank Aaron Bobblehead - The first 2,500 fans will receive a Hank Aaron Bobblehead, presented by Coolray Heating and Cooling. Georgia 811 Diamond Dig - Following the game, 100 fans will have the opportunity to "dig" for 10 assorted pieces of jewelry on the Coolray Field infield, courtesy of Frederick's Jewelers. Scranton/Wilkes-Barre RailRiders (New York Yankees) vs. Gwinnett Braves, 2:05 p.m.
Sunday Funday - Fans are invited to play catch on the field before the game from 1:10-1:30 p.m. and kids (ages 12 and under) are welcome to run the bases following the game as part of "Sunday Funday" presented by Georgia United Credit Union. Christmas in July - The Coolray Field concourse will be decorated with Christmas decorations and Santa Claus will be in attendance to greet fans and take pictures. Candy Drop - After kids run the bases, there will be a Candy Drop with a helicopter presented by BlueRidge Helicopters dropping candy onto the field for kids 12-and-under to run out and scoop up.